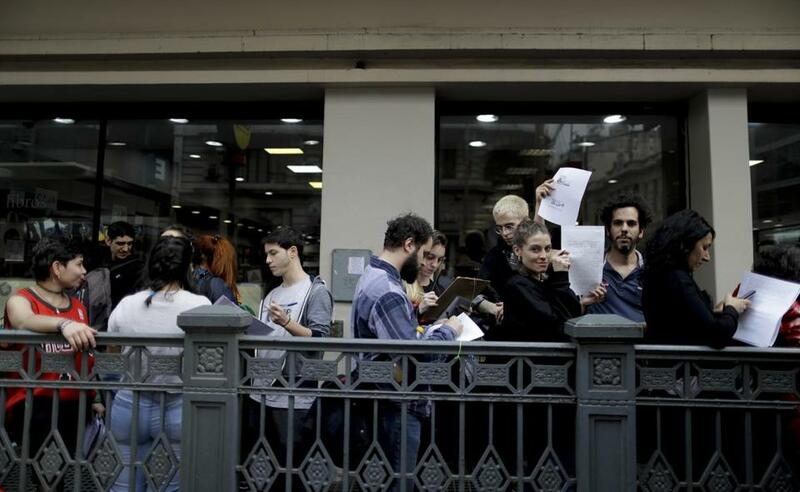 People formed lines Saturday in Buenos Aires to deliver forms to renounce their religious affiliation. BUENOS AIRES — Hundreds of people gathered in Buenos Aires on Saturday to oppose the influence of religion on Argentine politics and encourage people to quit the Roman Catholic Church in the wake of a Senate vote not to legalize some abortions. The event, called ‘‘Collective Apostasy,’’ centered on a signature drive for Argentines wanting to renounce their affiliation to the church through a form that will later be given to the Episcopal Conference in the homeland of Pope Francis. ‘‘We are receiving the apostasies of all the people who want to renounce their ties to the Catholic Church,’’ said one of the organizers, Maria Jose Albaya. ‘‘Obtaining the vote for women, the divorce law, marriage equality, the gender identity law, the assisted human fertilization law, the law of integral sexual education, the dignified death law were all done fighting clerical power, which seeks to have total dominion over our minds and bodies,’’ the event’s manifesto published on social media said. ‘‘The discourse by the church to convince the people to not accept the (abortion) law was so outrageous that I reached the height of my enmity toward the Catholic Church,’’ said Nora Cortinas, a founding member of the Mother of the Plaza de Mayo human rights group. ‘‘But the Catholic religion is, was and will be the most important religion in our country,’’ the 56-year-old said.